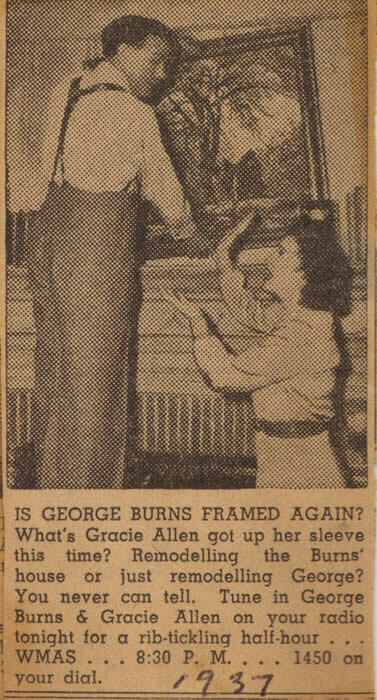 George always wanted Gracie to have top billing! 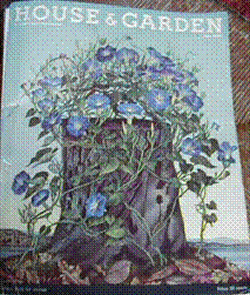 "Painted in 1936. At my Halifax (Vt.) House. 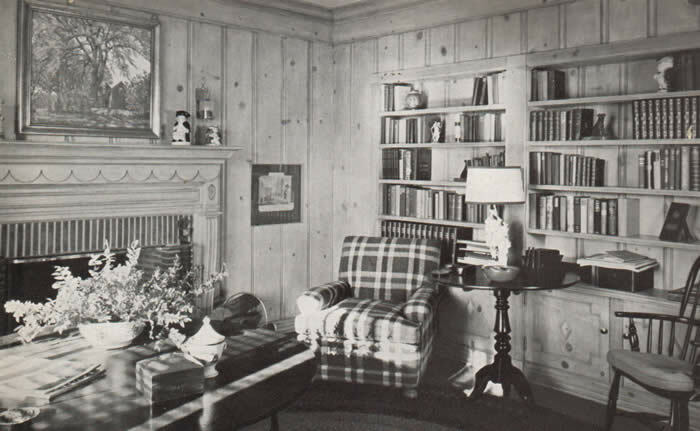 Taken by Harold Grieve from the studio in 1937 to Hollywood, California, and sold by him to Gracie Allen and George Burns of radio and movie fame for the library of their home at 720 North Maple Drive, Beverly Hills, California, which Mr. Grieve had decorated, as one of the most prominent interior decorators of the country." George and Gracie hanging Dooryard Elm in their library. Note the painting Dooryard Elm on the wall behind them. 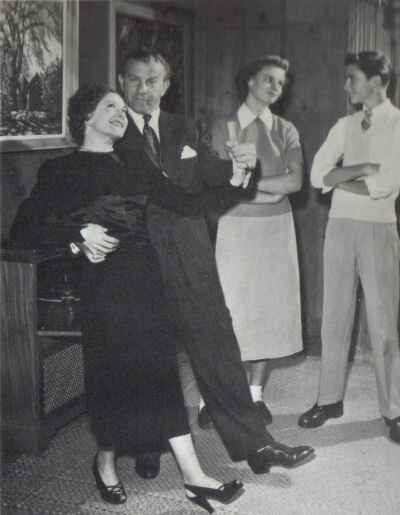 Photo from book "The Third Time Around" by George Burns. Although the quote above is taken directly from the RSW Painting Diary, it is not exactly the way I remember it. Harold Grieve, (during the 1930s and '40s) was a rather frequent visitor to the Woodward estate on Upper Street. 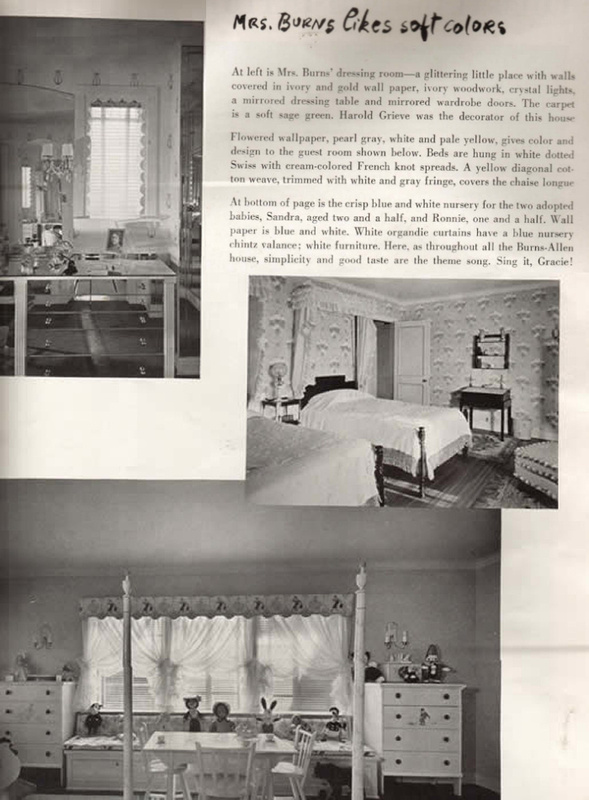 I think the visit mentioned above was about Christmas time in 1937, and he was at that time interior-decorating a new home for George Burns and Gracie Allen in Hollywood, California. He mentioned that he had "designed in" the perfect site for a Woodward painting in the Burns' library. Soon after he left for California, Fabian and I packed up three paintings in one of the big wooden boxes, and these were sent by railroad freight to Mr. Grieve to show to George and Gracie to select the one they preferred. They chose Dooryard Elm to hang in their library. I have no memory of the other two paintings ever being returned. I think Mr. Grieve probably sold them to other Hollywood clients of his, but I have found no record of this. To the best of my remembrance, neither Gracie nor George ever visited RSW here at his studio. They did correspond, however, especially Gracie, such as notes at the holiday times. I remember a Christmas card coming at one time of which RSW was especially appreciative, but it can not be found among the RSW memorabilia. 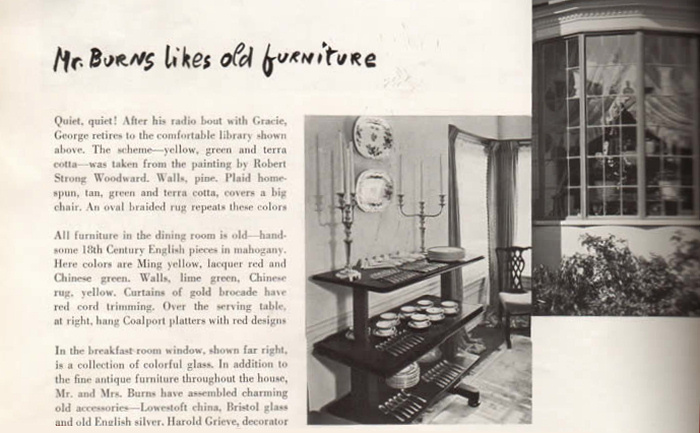 House and Garden magazine of June 1937 published an article about George Burns and Gracie Allen with photographs of their home which had just been designed by Harold Grieve. Pages from the article appear below. 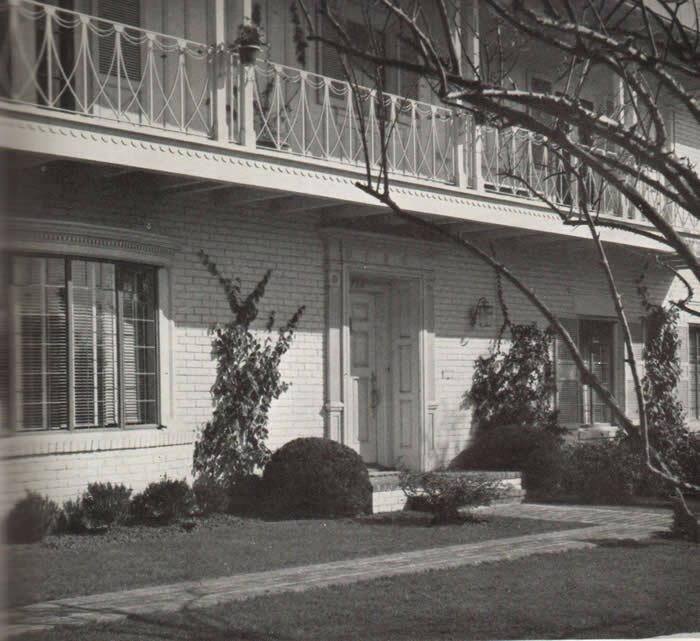 The front entrance of the Burns' home. 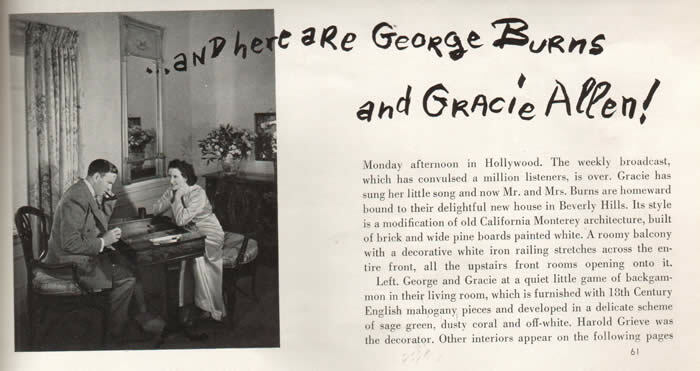 George and Gracie in their living room. 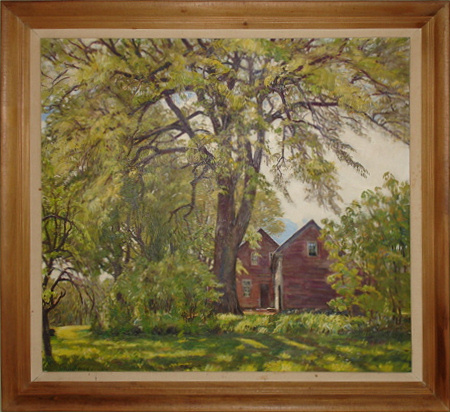 Burns' library showing the oil painting Dooryard Elm by Robert Strong Woodward. Two views of the Burns' home. Other views of their home. 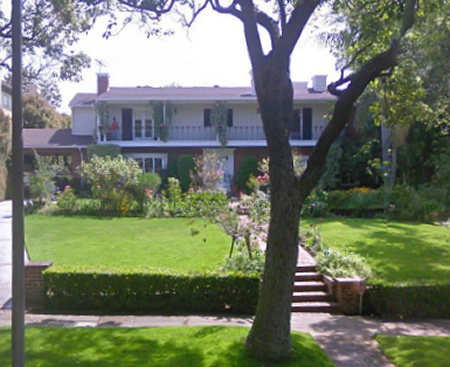 View of the Burns' home today. Gracie died at age 69 in 1964 of a heart attack and George died 32 years later in 1996, just after his 100th birthday, following a fall in which he sustained a head injury requiring surgery. Both were buried in the Forest Lawn Memorial Cemetery. Grave marker for George Burns and Gracie Allen. 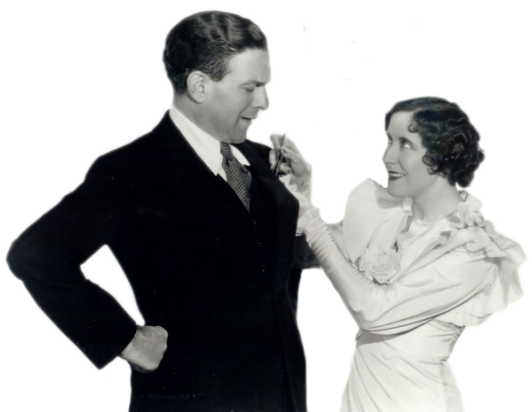 Upon being interred with Gracie, the crypt's marker was changed to, "Gracie Allen and George Burns - Together Again." 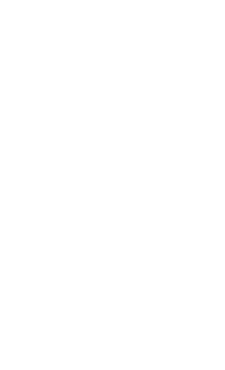 George had said that he wanted Gracie to have top billing.